Cleaning grill grates may not be the most exciting activity on your summer schedule, but if you plan on cooking outdoors it is a task that needs to be done. Here are three techniques you can use. Like most with most items that require cleaning, barbeque grill grates can be cleaned using a variety of different methods. To put them broadly, these methods are burning, brushing and soaking. The second way is to put your grates in a self-cleaning oven and run them through the cleaning process. Be cautious with this one since it could end up discoloring your grates. If you don't mind what color they are, it is a simple method to use. Fill a large bucket (one big enough to accommodate the grates) with hot water and one quarter cup of the dish soap you use to wash dishes in the sink. Stir in a quarter cup of baking soda until you have a good lather in your bucket. Drop the grates in the bucket and let them soak for an hour. Scrub them with a steel wool pad to remove any remaining debris. Rinse the grates with your garden hose. An alternative soaking method to use is pouring a cup of ammonia on the grates and letting them set in a plastic garbage bag for 12 hours. If you use this one, it's very important that you rinse well, since the ammonia flavor could seep into your food. 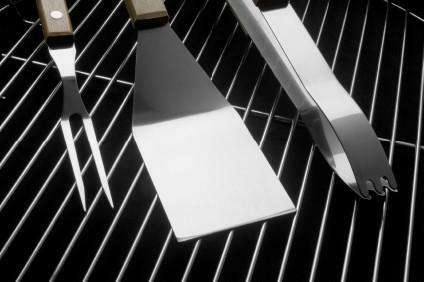 The brushing method is a quick fix that you should do after every time you use your grill. It's best to do so when the grill is still hot. Just be careful not to touch the grates with your hands. Stand in front of your grill and place the head of the grill brush on top of it. Starting at the top of the left side, move the brush in the direction of the wires on the grates. Continue brushing in this manner until you have cleaned the entire grill. Shake the brush over a garbage bag to remove any debris from it. Debris that fell into the grill should burn off the next time you use it. To preserve your grill grates to the best of your ability, never put anything inorganic in your grill, such as plastic or Styrofoam. Once you have a material such as this on your grates it is difficult to get it off, and it releases potentially toxic fumes. This is not usually a problem unless unsupervised children or a copious amount of alcohol is present while you're cooking out.